Volleyball drills advanced - section presents simple ideas for more advanced players to develop their game. This section provides volleyball practice drills, which utilize already learned basic skills to learn a deeper understanding of the game. In this section the volleyball skills, which we have been introduced already will be used in game-like situations. Another goal is to develop tactical understanding of the game. Volleyball Drills Advanced - How to Teach Players to Be Good at the Game of Volleyball, Not in Drills? There has been lots of talk in the volleyball community about importance of letting players play, instead of running drills, which are not taken place in the game context. For example traditional two-man peppering have been one of the drills which have been criticized. How the Volleyball Drills Should Look Like? 1. The volleyball should be flying over the net. 2. The opponent should be playing in the other side of the net. 3. Use Game-like sequences. Work on cooperation with teammates. I.e. 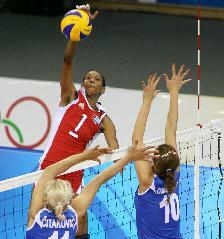 in the hitting drills, the volleyball should be set to the spiker, not tossed - just like in the game. In the blocking drills, the block should be practiced against the setter and approaching hitter. In the digging drills, make sure the opponent hits the ball to defender over the net, etc. Let's see a couple of simple examples how we could replace the traditional two-men peppering. Instead of doing a tradional two man ball peppering off the net, players should move to perform this warm up over the net and hitting the ball over the net. The players should form three-man groups in the both sides of the net. One player being passer, one setter and one hitter. Each court side could have even three of those groups next to each other, which means even 18 players could be warming up on the one court. 12 players, if the court is divided into two halves. Start by serving the ball over. The other team passes, sets and hits the ball over. Set or bump the ball over for few minutes until you get warm. Players rotate clockwise after the ball is delivered over the net. Players start approaching and hitting the ball over the net to the defender when they are warm enough. These attacks could be performed behind the 10-feet line to make sure the rallies will be longer. Form two-man groups, one being the passer and other one the target/setter. A group starts by serving the volleyball over the net. The serve receiver passes the volleyball to the target who catches or performs a set. Next receiving team switches and the target/setter runs to the back court and serves the volleyball to the other side. (Players get warm really quick since players have to move a lot when changing the positions.) The cycle continues. Two-men teams could also perform a similar serve-pass-set-spike warm up than above. The receiver approaches and hits the ball over the net to the defender who digs the ball up to the setter who sets, etc. Players can switch positions in the own side after delivering the ball over. Do the same behind 10 feet. Other drills being criticised have been i.e. volleyball hitting drills in which the coach tosses the volleyball to the spikers - or "warm up swings" in which the spiker tosses the ball to the setter before approaching and spiking. Volleyball Drills Advanced - How to Set Up Volleyball Spiking Drill? 1. The setter should be setting the ball to the hitter, not tossing. 3. The spiker should have blockers to block the ball - and defenders to dig the spike. ...so basically all the drills should remind the game as much as possible. ...which is a great thing because we all just love to play. Who wouldn't like to play games? Learning volleyball by playing is certainly not a new idea. As one example many junior or mini volleyball coaches in the leading volleyball nations have been using 2 vs. 2, 3 vs. 3, or 4 vs. 4 games on the small court to teach volleyball to the beginnning volleyball players. The court has to be small. It makes the rallies longer and players get as many contacts as possible. The main purpose of these drills is the skill development, but there is also another aspect there. There is hardly any big court volleyball strategies involved in these games, but players learn to play against the opponent. Players learn to read the game. They learn to anticipate and make faster decisions on the court. Players who play a lot eventually learn to know where the ball goes before it actually happens. These players always seem to be on the right spot at the right time. This makes them look a whole lot of quicker on the court, even if physically they could be slower than the other players. A fun game for the beginning volleyball players is 1 on 1 volleyball tennis, which could also by used as a warm up. This particular drill is not a game-like since it has only 1 player in each team, but it is fun for sure. Each team has one player only. Each team has only one contact to deliver the ball to the other side. The court could as small as 10 by 10 feet (3 by 3 meters) - or 20 by 7 feet, if you want more movement front and back. This court size depends on the skill level. It is important to keep the court so small that the volleyball keeps flying. Players shouldn't be able to win a rally very easily. contacting the ball with various techniques - not only in front of the hips, but on the sides also. If the court is made a little bit longer, it gives the coach a good opportunity to work on the three point serve receive (the other knee on the ground). It is important for coaches to start teaching the game strategies and tactics from the very beginning alongside the skills development. When players' skill level grows and they are engaged in more complex drills, it is very important to explain them why the coach asks them to perform specific things on the court. This will help players to gain tactical knowledge of the game. Coach should always be teaching volleyball strategies and tactics to the players when running drills. Good Example: Explaining Volleyball Tactics and Teaching "Why"
For example when beginning volleyball players start practice spiking the volleyball over the net, they should be always taught which directions they should be hitting, where is the best spot for the tip etc. More importantly they should be told "why are they are performing those shots". Just hitting the ball over the net without any suggested direction or without block or defenders is probably not the best way to get players succeed in the match in which they have to face the opponents. And certainly the players don't learn anything about the tactics, if the players are not told "why". Volleyball Drills Advanced - How to form a Game Plan for the Volleyball Team? When the coach prepares a team for the game, s/he uses two methods to form the tactic. Or the combination of the two methods. A tactic is often build against the opponent – the coach has been trying to figure out which way is the best to beat the opponent. The other method is to build the tactic on the strengths and weaknesses of the own team. Earlier we talked about unnoticed offensive strategy, which is an important part of offense with the top level teams. This offensive strategy requires seamless teamwork between all the players. Most of the drills in volleyball drills advanced -section require more skilled players. The skill-level of beginner volleyball players may not be high enough for these drills. To help to judge the difficulty of the drill we will scale them – we give 5 stars for the drills that are very complex and require years of training and 1 star if they are considered beginner drills. Naturally other stars have difficulty between those two examples. Examples of drills which help you to play quick offense. How to improve timing between the hitters and setters? Volleyball has become faster. 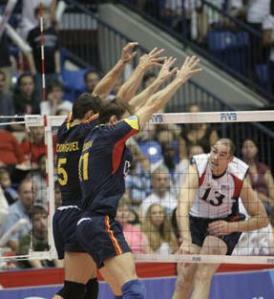 You find tips how setters, passers and hitters learn to play faster game. To find more pages, go to Volleyball Drills page below.